Everything is made entirely by myself or with help from my partner, Skye. We are full time artists working from home while raising our bright and beautiful child, Sekoyah. Living off grid in the jungle of East Hawaii makes our process unique- everything created is with sun power and everything dyed uses rain catchment water. 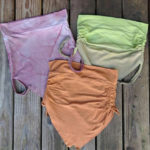 I use professional fiber reactive dyes as well as an assortment of natural dyes, some locally harvested (from my yard!). I am an ever growing seamstress, clothing designer, and dye creatrix. I strive to be more sustainable with each new creation, hoping to one day only source my dye material from my yard and gardens. Giving thanks to mama Earth for the abundance we are provided with. And giving thanks to all who have supported our journey! I hope to create for you soon. Aloha!